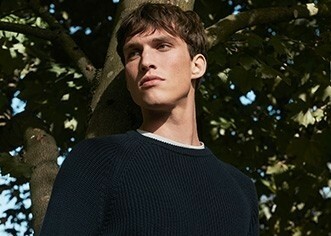 The iconic Sunspel sweatshirt, a modern take on an athletic staple. The yarn has been indigo dyed and then washed down to give a natural look. All the hallmarks of our classic style are here including iconic V-stitch insert, rib cuffs and neat fit. This fabric has a slightly more textured finish – expect it to fade with wear for a washed effect.